Hello everybody! I will be writing a piece each week of the season about who underperformed/underwhelmed in the previous game. Let me just say this. My job will be VERY easy if every week turns out the way last week’s 20-15 loss to the Jags turned out. Very few times in NFL history, if at all, could you point to a Right Tackle single-handily sinking a team’s season. I am here to tell you that if the Giants do not make a change quickly, this will be the New York Giants undoing. 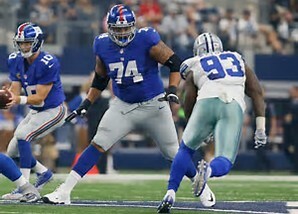 Ereck Flowers, the former 1st round pick might be worse at Right Tackle than he was at Left Tackle, and that is saying something. By the way, this is me trying not to overreact either. Where do I start? Oh, I know! Let’s start with the FIRST play of the game! Ereck Flowers was torched by All-Pro Calais Campbell for what would have surely been a sack. Had Flowers not stuck his leg out in pure desperation and deliberately tripped Campbell, Eli might not have made it through the first play of the game. Flowers was flagged negating a 6-yard reception by Odell Beckham Jr.
Not to be outdone by his first terrible play, Flowers then committed a hold on the THIRD play of the game that was inches from being a safety. On that play, a 34-yard catch was also negated due to the penalty. So, for those counting at home, Flowers negated 40 yards of offense by himself on the FIRST possession of the season. Later in the first half, Flowers was abused by Lerentee McCray for an easy sack of Eli Manning. Flowers put the cherry on top of one of the worst performances from a Right Tackle that these eyes have witnessed. Stuck between not knowing which guy to pick up on a pass rush in the 4th Quarter, Flowers decided to pick up no one and let Yannick Ngakoue run right past him. This immediate pressure forced Manning to step up into the pocket. In doing so, Patrick Omamhe (who was also beat on the play) allowed his man to get into Eli’s face, which led to a tipped ball INT that was returned for a TD, essentially sealing the game for the Jaguars. So, in summation, Ereck Flowers had a tripping penalty, a holding penalty, allowed a sack and allowed countless pressures that hindered this offense greatly. The Giants will likely allow Flowers to have one more start to prove that he has ANY worth to this team. If or when Flowers fails again against a much weaker Dallas Cowboy pass rush, the Giants will be forced to make some type of move. This Right Tackle might cost the Giants their 2018 season. He was THAT bad. Welcome to the Film Room.